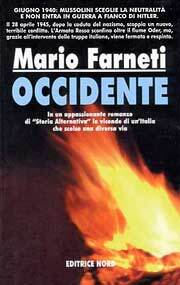 Farneti, Mario. Occidente . Nord 2001. What if: Italy remained neutral in World War II. Although the war ends in late 1944, World War III starts six months later when the USSR attacks the West. Italy plays a crucial role in the defeat of the Soviets and becomes a major world power. Series note: Series including, so far, Occidente , Attacco all'Occidente , and Nuovo Impero d'Occidente . The series is also being adapted in comic book form as Gli Albi di Occidente . Summary: In 1972, the 50th anniversary of Italy's fascist government, a power struggle between the fascists and King Carlo Alberto II comes to a head when royalists steal a secret trasure given to Mussolini by the pope. Secret agent Romano Tebaldi tries to retrieve it and avert civil war. Series note: First volume of Occidente. Published: Nord 2001 (8842911720), rev. and exp. 2003; and Tea 2006. Summary: In 1992, the Arab Federation falls under control of the Black Crescent and goes to war. Italy's Romano Tebaldi is entrusted with the safety of Europe. Series note: Second volume of Occidente. Summary: In 2012, the Italian Empire is shaken by an epidemic and chaos. Series note: Third volume of Occidente. Series note: Comic book adaptation of the Occidente series, beginning March 2006 with (#1) "Terza Guerra Mondiale".